My soft spot for ice cream goes back for as long as I can remember. The chimes of the ice cream van driving into our street on hot summer days remains a fond childhood memory. I’d rush to join the queue and then deliberate over which ice cream to spend my pocket money on. Usually it was a choice between a Screwball or a 99 Flake – both iconic ice creams of the 1980s. The Screwball, an odd looking plastic cone that came with a mini spoon, usually won me over. It wasn’t the added prize of the chewy ball of bubble gum at the bottom that tempted me but rather the raspberry ripple flavour. It’s a flavour that’s especially popular in the UK and ‘consists of raspberry syrup injected into vanilla ice cream’ (thanks Wikipedia). Almost 30 years on from those first moments of ice cream pleasure I still love the stuff. But nowadays I make ice cream a healthy treat by making it at home without added sugar. Which brings me to this fig ripple ice cream. Childhood nostalgia wasn’t my only inspiration for this recipe – my ripple idea came thanks to Vintage Valley Reduction Sauces. They’re a lovely local company who kindly sent me some of their reduction sauces to try. I’m a big fan of buying local and supporting Australian brands where possible so I was pleased to hear that all of the grapes used for the Vintage Valley products are sourced from the Hunter Valley wine region, just a couple of hours drive from my home in Sydney. 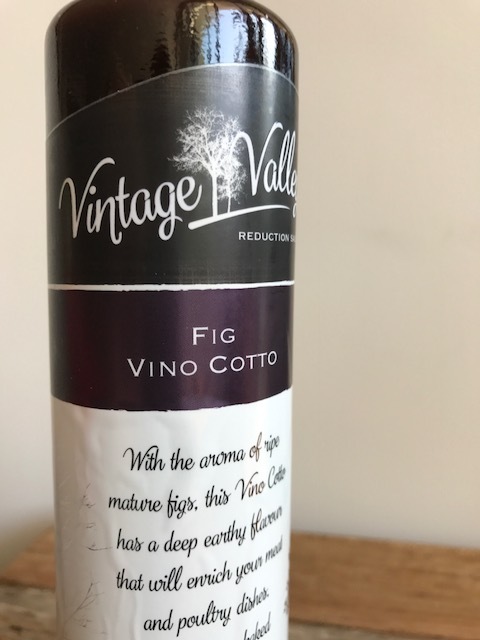 Here I’m sharing my first experiment – using their Fig Vino Cotto. This recipe is as ‘guilt-free’ as ice cream gets. 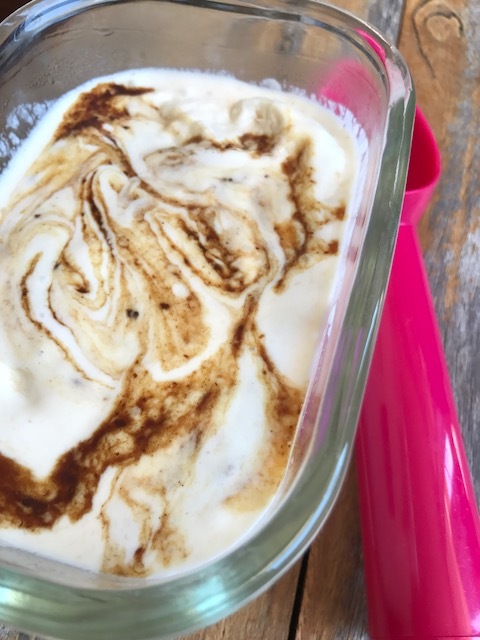 Not only because it’s made with probiotic packed yoghurt (instead of cream) and boasts no added sugar (the bananas bring the sweetness) but also because figs are packed with a whole host of vitamins and minerals. Blend the bananas and yoghurt into a smooth consistency. Add the mixture to a glass bowl and transfer to the freezer. Allow to set for 2-3 hours and then blend again – the consistency should be thick and creamy. Stir through the optional chia seeds and/or cacao nibs then drizzle through the fig vino cotto and gently stir. Pop the ice cream back into the freezer for as long as it needs to reach your preferred texture. For soft serve ice cream the second freeze will take 1-2 hours. For a firmer texture allow up to 4 hours. Vintage Valley is made and bottled on the North Cost of New South Wales, with grapes sourced 100% from the Upper Hunter Valley. The grapes are blended with fruits to create a range of flavours – fig is just the start with other flavours including cherry vino cotto, blood orange vino cotto and caramelised red and white wine vinegars. Tags: fig, homemade, ice cream, ripple. Bookmark the permalink. Wow! It looks luscious & delicious !! Thanks Megala – I’m about to enjoy it very shortly for tonight’s dessert! Yes the ripple makes it Maria – it’s so easy to make and you can add optional extras like chia seeds and cacao nibs and still keep it super healthy. Thanks for stopping by. Absolutely gorgeous. I agree on the guilt free eating!! Lovely share. Thank you for your kinds words…. I’m going to have to look out for the wine. If unavailable what should I substitute with? 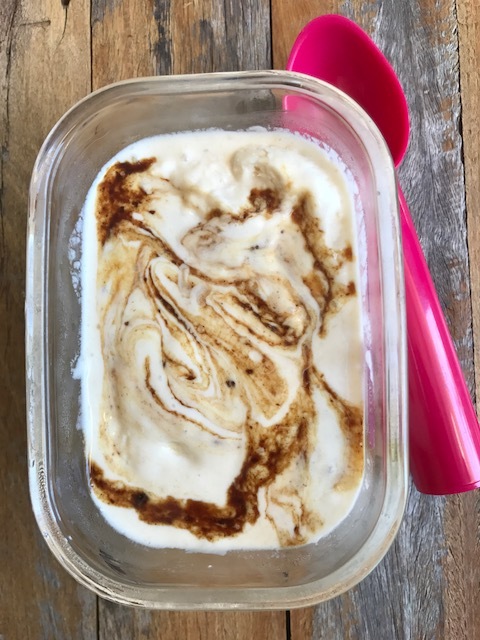 Because I have to tell you – an ice cream recipe without loads of sugar and eggs is something I don’t come across too often. I suppose it’s the banana that makes it sweet? Hi yes the banana and fig sauce makes it sweet – the riper the bananas the sweeter! And if you can’t find vino cotto you could always blend a handful of berries and then stir through the berry sauce for a ripple effect. Hope this helps…. That’s the great thing about foodie blogs. You get answers to your questions. Thanks, Laura. Thanks Mary – feel free to send any other questions my way…. I love the addition of fig sauce in this recipe Laura! 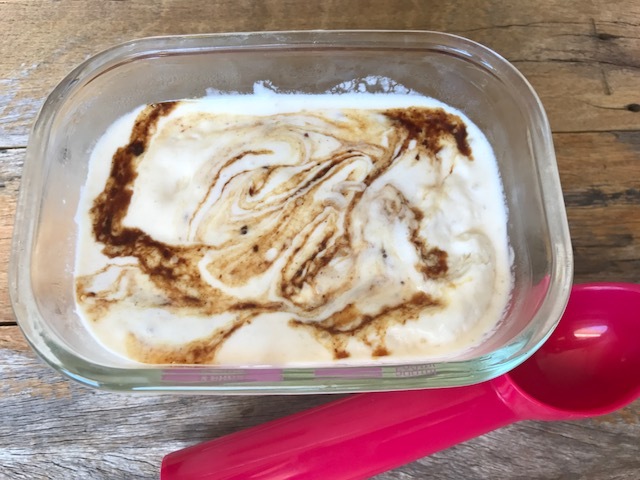 Thanks Sandhya – yes the sauce is working well and I’ve already made this recipe a good handful of times! This is fascinating. I thought you’d use fig jam, but vin cotto! Wow!!! Thanks Chef Mimi – good idea on the fig jam – that would work too! I like this recipe Laura. Ah man, favourite flavours are #1, Grapenut (a Jamaican ice cream), then black cherry, French vanilla, pistachio…to name a few. 😀 Ice cream is freaking awesome!! Totally agree Eartha – Ice cream is awesome. French vanilla sounds right up my street too. Thanks for stopping by! Thanks for your lovely words Nathan and yes with this combination of ingredients it’s an ice cream that’s actually good for you. I hope you give it a go! Thank you – yes too often ice cream and healthy would never appear in the same sentence! Fig and banana is the best combination! So delicious!